Why Take A Cruise For The First Time? Cruises used to be considered old fashioned, frequented by grandmothers and pension people with nothing else to do with their lives. Cruises offered these oldies a quiet pampering atmosphere, a slow game of shuffleboard, poker games, never ending meals and stand up comics for entertainment. Sort of like the hotels in the Catskills in upstate New York. There are thousands of different itineraries reaching a myriad of ports around the world. Some cruises reach islands you have never even heard of. Whatever your taste and flavor, there is a cruise designed for you. Depending on your goal, cruises allow you to take on as much excitement as you can handle. You can choose to sightsee at every port of call. Or you may remain on board where you can attend lectures, work out on gym equipment, luxuriate in the spa, have a massage or simply sit poolside sunbathing or reading. When the sun goes down, you can enjoy shows, games or a quiet evening under the stars. The choice of menus aboard a cruise is vast, with international cuisine from all over the world. Cruise holidays are usually less expensive than stays in hotels. Once you have been on a cruise and have visited a variety of destinations, you will want to take all your holidays aboard a cruise liner. Today’s cruise ships offer more than just a stateroom. Many rooms have balconies and large windows, rather than the older smaller port holes. Some staterooms have more luxurious beds and bedding and offer en suite options. On some cruises anything goes—jeans or suits, shorts or skirts. Choose the cruise that best suits your style—formal or casual. Cruises have become the ideal venue for families and friends to spend quality time together. Groups should plan the cruise together, making key decisions about staterooms, cuisine, destinations, shows etc. The most important thing is to have a fun time together in a relaxing, exciting atmosphere. When you go as a group, you form closer bonds of friendship and family. Many cruises offer special onboard programs that enrich your lives in various areas. Delve into poetry and prose, become a wine connoisseur or an expert antique dealer, learn about regional cooking, horticulture, music and animals. Is it any wonder that cruisers are more satisfied with their choice than with any other type of holiday? Contact us today and one of our friendly staff will help find the right cruise for you! 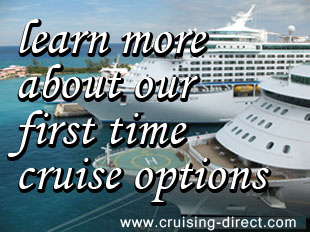 why take a first time cruise?